Today, we sat down with Joe Kelly, a founding partner of Man of Action Entertainment, the creators of the boys’ action global franchise phenomenon Ben 10 and the team and characters in the hit film, Big Hero 6, to talk about their new project. Man of Action are the original creators behind Zag/Method/Samg TV show Zak Storm, set to launch in 2017. He discussed with us their desire to create a modern-day adventure show, Zak as a hero, and the fun that’s coming next! How was the Zak Storm concept created? We love the themes of exploration and discovery, especially in a program for kids. There’s something inherent in a pirate story that scratches that itch. However, we were seeing all these great pirate franchises in the movies, like Pirates of the Carribean, and shows like Jake and the Neverland Pirates but we didn’t want to tread those same roads. We began gathering ideas of different genres and stories that we liked from our childhoods to see if they would somehow fit into something that would feel like a pirate show with a twist. Zak Storm is exactly that. We all have this child inside of us who wants to go out on adventures and explore uncharted lands. In this case, the uncharted territory is the Bermuda triangle where anything—from any time—can happen. Zak’s adventures are unpredictable, exciting and most of all fun in this strange new world of the Seven Seas. Who is Zak Storm as a character and how is he different from other pirate characters that we’ve seen in the past? A typical pirate’s life is filled with debauchery, but Zak Storm is no average pirate. He’s an honorable but rebellious, self-driven kid, looking to protect denizens of the Seven Seas and ultimately find a way home. He has to learn to walk the line between rebel and leader as he becomes captain of a crew of misfits to fight against evil in the Bermuda Triangle. In the show, Zak’s journeys are filled with important life lessons, but none are as important as understanding the value of those around you. Watching Zak work with, and even argue with his crew will show kids the importance of working together. Can you tell us a bit about his journey and his crew? Zak commands the hi-tech ship aptly named “The Chaos.” The Chaos is a ship that fulfills every modern child’s wildest dreams. It embodies the patchwork feel of our Bermuda Triangle where all corners of space and time collide in the most weird and wonderful way. Equipped with everything from solar sails to Iron Age rocket launchers to futuristic alien legs, The Chaos allows Zak and his group of quirky boatmates to trek the seas in style. All of the characters on board The Chaos have their own unique appeal, a group of outsiders led by one brave hero. Zak’s right hand man, or shall I say sword, “Calabrass,” provides salty guidance that an often-distracted Zak needs. The “brains” of the group is a quirky, nervous alien inside of a yellow mech suit named “Caramba,” who is comical, intelligent, and eager to help Zak try outside-the-box experiments. “Crogar” is a larger-than-life Viking who fears no dangerous battle, along with no silly prank of Zak’s. “Clovis” is a playful ghost who partakes in many of his pranks, but never lets a beat slide when it comes to defending the Triangle. “CeCe,” is a runaway Altantean princess who chose a life of adventure over a life of luxury. She’s the ship’s navigator and helps Zak guide the team to victory against the villains of the Triangle. What was the process in creating Zak Storm? Like most animated shows, the editorial process of Zak Storm took a long time. Each detail was crafted to ensure that Zak and his crew were graphically and creatively strong. Calabrass was one of the characters who took the longest. His defense functions are based on each of the Seven Seas. Throughout the series, Calabrass showcases all of his functions when Zak uses him in battle. CeCe also took some time to dial in. She is a strong, driven female character who is not an accessory by any means. She is the glue that holds the crew together, and her ability to see the big picture plays well against Zak’s impusive nature. The details of their ship, “Chaos,” are incredible as well. How did you guys come up with the idea of setting the show in the Bermuda Triangle? It’s this place full of mysteries and secrets. Home of the unknown. By staging a pirate scenario in such a universe, we can introduce characters like aliens, Vikings, and Roman soldiers (all these characters that we loved as children). There are no limits to what can and cannot exist. This Bermuda Triangle, of course, is not like what you read about in National Geographic. This is a bright green, hi-tech prism that floats above the choppy waters of the Seven Seas. The added futuristic element invites multiple worlds into the spectrum of Zak Storm’s universe. It breaks the conventions of the pirate universe with which we have become so familiar. What is Zak Storm’s journey ? Zak begins his journey as an impulsive kid, full of energy that he is unable to direct. This is, of course, something we can all relate to. Children will be able to see themselves in a character who exhibits realistic traits for someone his age. The difference between Zak and most, however, is that Zak has to step up and evolve in order to become the leader of “The Chaos.” Through courage and the ability and willingness to listen to his team, he learns that leadership is really about the help of others. In the typical pirate genre, the goal is to win the battle at all costs. Zak Storm and his crew show kids that the goal is not just to win, but to win together. Zak Storm plays an important role in teaching children the value of sharing victories. The focus is on Zak (the captain), but in many of the episodes, Zak shares his victory with his crew, often telling them that, without their hard work, none of this would have been possible. This is very important for children to learn at a young age so their idea of success is not purely self-serving. Who is your favorite on the crew? That’s very hard to say. That’s like asking who your favorite child is. They all have such special talents and personalities that carry the show. I enjoy the brains of the group: Caramba. Caramba and Zak make up a wonderful contrast that represents the creative and analytical instincts we all have inside of us. Zak is a kid. As kids often look at the world with a playful, innocent sense, Zak leads with a sense of audacity. The rest of the crew represents the more “mature” behavior, providing the structure and ideas necessary to achieve success… except for Clovis. He’s even less mature than Zak. How does this show set itself apart from others like it? Zak Storm is the hero’s journey, one we have grown to love over the span of television and cinema. He is an instinctively good kid who has never been responsible for anything, but is now responsible for the fate of the Bermuda Triangle. The show never loses its spark. The constant ability to tie multiple genres and universes into one world keeps kids (and adults) entertained. But it is the message that truly drives Zak Storm home. The show teaches children through a fun and exciting experience that leadership is about giving back, hopefully contributing to the creation of a strong generation of future leaders. 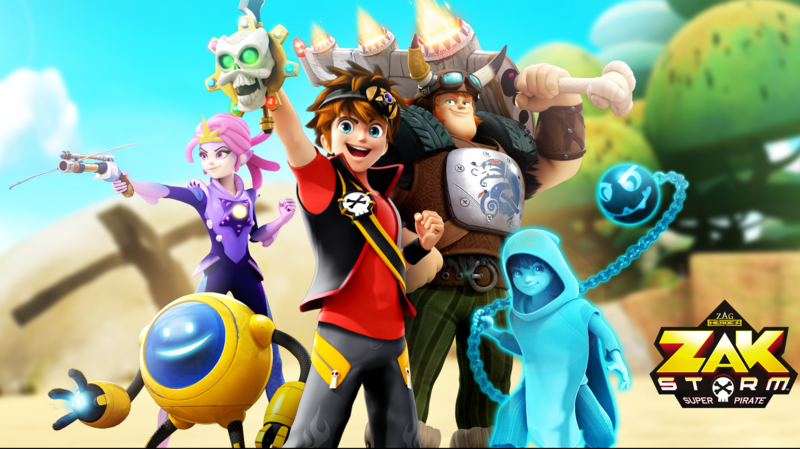 Zak Storm is set to launch on leading tv channels across the world in 2017, including Gulli (France), Super RTL (Germany), SPTN’s kid’s channel, Pop (UK), DeA Kids (Italy), Spacetoon (Middle East), Canal Panda (Spain), and more! A comprehensive Toy Line will be launched by BANDAI.